IAP’s Skin-Client for Mobile enables Progress Developers to become App developers using 100% pure OpenEdge ABL in a remarkably short time frame. The Skin-Client for Mobile has a “write once, deploy anywhere” approach which means that your code will run on iOS and Android and Blackberry and Windows Mobile and J2ME. The Skin-Client for Mobile removes the need to learn device-specific languages or development environments and thus saves you valuable time and money in your App creation. The download version is the Free version of Skin-Client mobile. Everything you need to test Skin-Client Mobile and to run an App locally on your computer is included. This demo App – SC sports – will show basic features of the Skin-Client Mobile. Starting with a list of customers it will show details, map usage, device integration, search and much more. Building Apps for Mobile Devices (SmartPhones and Tablets) is crucial! 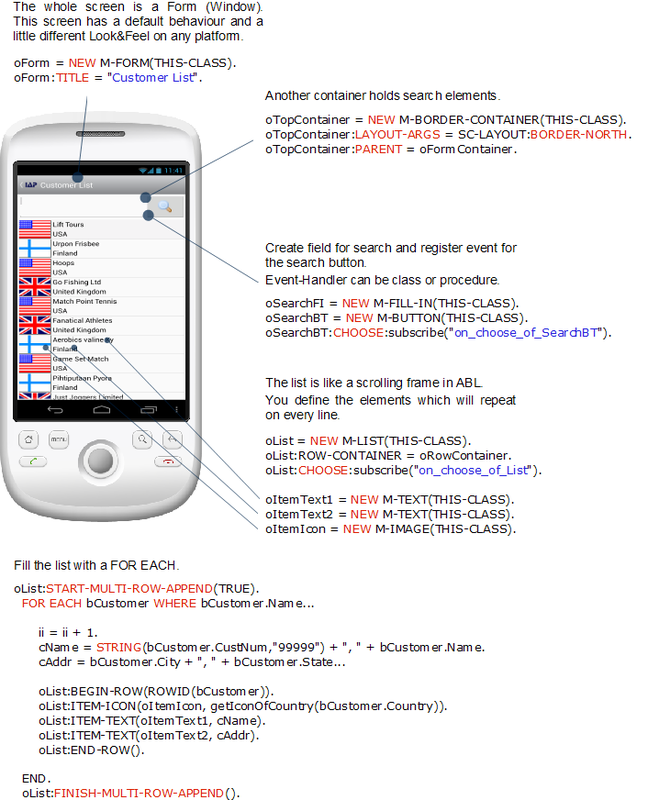 Skin-Client Mobile enables development in OpenEdge ABL! Skin-Client Mobile enables you to build Apps for mobile devices just using OpenEdge ABL. The Skin-Client generic client part is an App available for Android, IOS, Blackberry but also J2ME (Bada, Windows Mobile/CE; Samsung, Nokia, Sony, HTC, …) phones and tablets. It is completly server driven by procedures and/or classes written in OpenEdge ABL. The OpenEdge backend sends commands to the generic Skin-Client client part. The client renders the forms and sends back user events. The installation package contains the ABL code (Class API), the Skin-Client broker, generic Developer Apps for supported platforms, simulators to test and documentation. 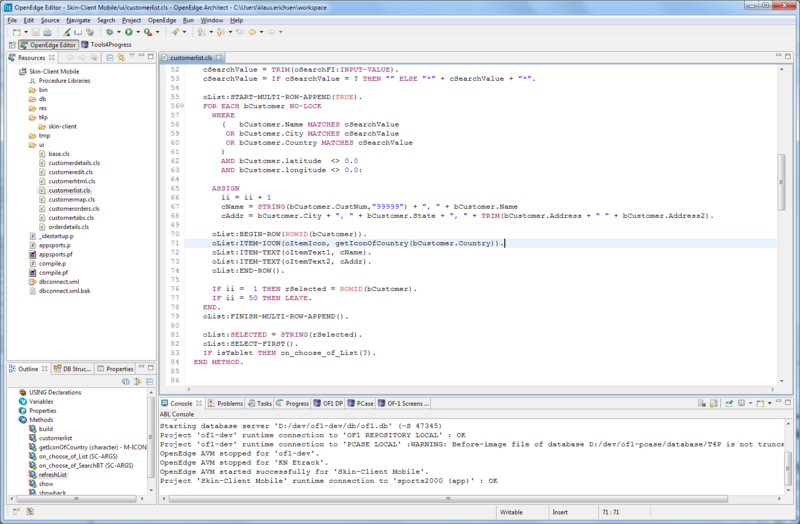 We support OpenEdge version 10.2B to 11.x..
Coding is done using your preferred ABL editor. If you use the OE Architect, you will benefit from code completion. You may use a procedural or an object oriented approach to program your App. Simulators allow you to test your App in Look & Feels of various platforms (iOS, Android, Pads) on your PC or you can test with real devices in your local network (LAN). Super short development cycles – after compiling in the Architect the newly created r-code will take affect when reloading the App page (e.g. go from cust list into cust detail will load new compiled cust detail r-code in background). Local Deployment means that you put a package (apk, ipa, etc.) on your test website. This can be used for testing and deployment. Depending on the target you may need additional setup (e.g. Enterprise agreement for iOS). You can brand an App – that means customize it for your company. That is the process to burn custom parts into the App (logo, splash screen, name, service URL, platform certificate). A Progress backend sends short commands to the Skin-Client. The Skin-Client renders the screens and send back user events like mouse clicks. The communication is done using socket connect or via http/https. Subscriptions are for the development system on an annual base. The runtimes are free from the Skin-Client Mobile point of view, but you must buy the corresponding OpenEdge licenses.